I think it was Nigella Lawson who once said that if she feels a cold or flu approaching, she’ll have a nice hot curry. If the curry is not able to kill the cold in its start, then it’s meant to come. Well, the male part of my family is flat on their backs with some cold bug. Yesterday, I made chicken soup and served peeled orange slices and hot tea. To no avail. Today is day 2, and I have been busy being the nurse who is all over the place making sure that the various patients are happy and getting enough TLC. Perhaps Nigella was right, and it’s the hot spices that chase the bugs out of the system. Now when my family is sick, rules are not as strict: that applies mainly to TV times and sweets consumption. With regards to the sweets consumption, I try and push in my home-made ones. It often works. 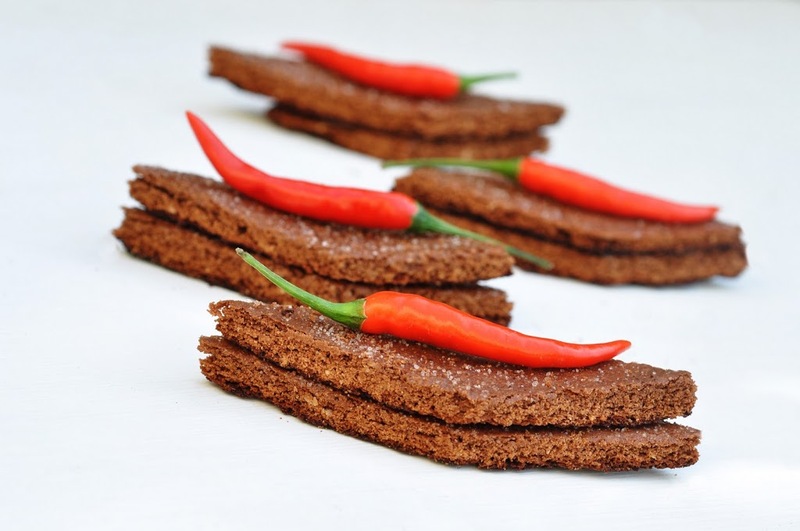 These chili-flecked graham crackers might even do the trick of getting the spicy spices in that are supposed to chase the flu bugs out, while serving as a sweet nibble at the same time. Well, hope is the last to die. What’s that other saying? A cold – with treatment it takes a week. Untreated, about 7 days. Well, so be it. These cookies, however, are delicious for anyone. With good and natural ingredients only, they are good for anyone healthy or sick. If you are not sure about the chili addition to these cookies, just omit it from the topping or start with just the tiniest amount, and work you way up to your personal taste. These crackers are one of the crispiest cookies I have ever made at home. The hint of chili make them something very special. Pulse flour, oats, cocoa, salt, baking powder and baking soda in a food processor until thoroughly mixed. Add palm sugar and blend again. Sprinkle butter cubes over the mixture. Pulse until the mixture resembles cornmeal. In a small bowl stir milk, honey and vanilla in a small cup until the honey is dissolved. Drizzle the honey mixture into the food processor. Process just until the dough holds together. Shape the dough into a flat disc. Wrap with cling wrap and refrigerate until cold but still supple enough to roll out, about 30 minutes. Preheat to 175C/350°F. Line baking sheet with parchment paper. Remove cooled dough from fridge. Roll the dough between two sheets of parchment paper until it is 1/8 to 1/16 inch thick and as even as possible from the center to the edges. Flip the paper and dough over once or twice to check for deep wrinkles; if necessary, peel off the parchment and smooth it over the dough before continuing. Peel off the top sheet of parchment. Prick the dough all over with a fork. Sprinkle the dough evenly with tiny pinches of salt (about 1/16 teaspoon total). Mix 1 tablespoon sugar with chili powder and cinnamon. Sprinkle the dough evenly with the spiced sugar. Slide the dough onto a large baking sheet. Bake until the Graham crackers are just starting to brown around the edges, 15 to 20 minutes. Let cool on the pan on a wire rack for 10 minutes. Cut into squares, diamonds or rectangles. Let cool completely before storing; the Grahams crisp up when completely cool.